This article is written on April 15th, 2013. The battledome may be subject to change after the date of publication. Hey there reader, welcome to my new column, State of the Battledome, on the Jellyneo Battlepedia. In this column I plan to cover current Battledome events, updates, releases, and community news. I plan to compose a write-up at least once per month; I'll write more frequently if more news is released regarding the Battledome. Speaking of which, we are now about a month removed from the Obelisk War, and Battledome related news these past weeks has been hard to come by. Sure, new pairs of weapons get announced in the news once or twice a week, but forget about those. Where are the serious updates to the Battledome? I don't mean to offend the collectors out there; the higher rarities of these new weapons are a welcomed change. However, the vast majority of the Battledome community is not concerned with fringe weapons being added to Illustrious Armoury. Rather, the Battledome community is starving for a major update regarding competitive play. Take a look at the first page of boards on the Battledome Chat. Take notice of the boards near the bottom of the first page. Notice how the last post on those boards was well over an hour ago? Activity on the Battledome Chat has been sluggish since the Obelisk War ended, and it is easy to explain why: There simply is not much to discuss regarding a daily. There is no Tombola Chat. That would be silly. It is just part of the daily routine. But save the guild recruiters, the weapon merchants, and the lovable off-topic posts on the Battledome Chat, you will be hard pressed to find many boards on the Battledome Chat that are just about battling. There is nothing to discuss, because there lacks any reason to battle beyond daily prizes thanks to the current state of the new Battledome. Battling is a quick routine for prizes these days, nothing more than that. Consider the debacle regarding prizes for the Obelisk War. In a recent editorial, The Neopets Team explained that the long delay for prizes was due to the question: What is the most justifiable way to reward each player's efforts? Chances are that the Neopets Team is having a difficult time answering this question, hence the long delay for prizes. That is understandable; there is no good answer due to the set-up of the event. In a way the Obelisk War represents the new Battledome as a whole: a mess that will take quite a bit of thinking to correct. Sooner or later the prize shop for the Obelisk War will finally open. It is guaranteed that there will be cries of disappointment no matter how the prizes are ultimately distributed. It is essentially already done. Let's accept it and move on; it's over. But we still have the future of the Battledome in front of us. It is still possible for the Battledome to regain its competitive aspects, its entertaining aspects, and its mentally rewarding aspects. All of these elements, the reasons why real battlers play Neopets, can join the daily prizes aspect of the Battledome to generate a level of activity the Battledome community has not seen in years. Will it happen though? No one knows. Some players like to believe that Jellyneo is loaded with insider information. I can tell you that claim is untrue. I know no more than the next player. I wish I had the answers, but mostly I just wish the Battledome would be updated to enable competitive play again. With every passing day of silence regarding the Battledome, the community dwindles. I respect those who stick with me in campaigning for the revival of our hobby, but at the same time I understand those who have given up hope. Glitches cripple both 1-Player and 2-Player battles, but past the glitches lays other issues. I fully believe that the Battledome community can break the trend and begin to grow again, but the longer the silence, the more this hope of mine diminishes. Some dedicated Neopians have taken to listing the glitches in the new Battledome. Their efforts should not go unappreciated; it took quite a bit of work to list the cringe-inducing number of glitches plaguing the Battledome at the moment. The solving of these glitches would be a giant step, but more must happen to make the Battledome lovable again. 1-Player absolutely needs HP-increase to become a viable hobby, and 2-Player needs a faerie ability overhaul combined with the re-implementation of stances and species traits. 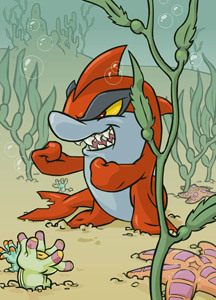 A system that utilized both the difficulty system and the HP increase system would be the perfect scenario for the entire Neopets community. The unlimited daily prizes could still be in play with the difficulty system, and the ability to show off mass amounts of progressively more difficult-to-attain wins could be exhibited in the HP increase system. I have spent an absurd amount of time dissecting the merit of including HP increase in the new Battledome, so I will consider this enough HP increase propaganda for this article. OK, I have one special note I want to make regarding HP increase. The Neopets community reached a special day last summer. For the first time ever, select fan sites gained recognition from the Neopets Team. The community can now reference and link select fan sites without fear of punishment. 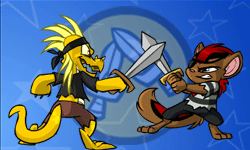 This also means for the first time ever we have the opportunity to host and organize player operated Battledome events offsite while remaining within the rules of Neopets. I have been a participant in many fantastic onsite-organized Battledome events in the past, but this is huge. We now have an opportunity to make Battledome events that are more organized and bigger and better than ever before. Such events could maintain and grow Battledome interest, but only if we have a competitive side to the Battledome. I'll let you in on a little secret. Prior to the first wave of the Obelisk War, we here at the Jellyneo Battlepedia wanted to host a tourney for the war. Such competition would have made a number of battlers fight well past any cap limits (doing your part) imposed by the Neopets Team, just for the sake of competition and guild loyalty. Unfortunately, no such tournament ever materialized. Why you ask? The difficulty system killed off any motivation for leading such an event. A massive accumulation of wins against a difficulty system opponent means that a battler made an impressive/insane time commitment, but nothing more. The first win against a difficulty challenger serves as enough evidence that a battler could get an infinite number of wins against a challenger if time was no issue. There was no opportunity for a player to push the limits of what is possible given their pet and resources, and we were not going to recognize what was essentially nothing more than endurance clicking. That's simply not fun for anyone. 2-Player battling is a beast of its own. 2-Player battling is all about competition. 2-Player battling is about winning, more winning, and the satisfaction of winning. With that said, there is little opportunity for competition currently. Glitches play a bigger role in the outcome of battles than strategy. Glitches can be fixed, but the state of 2-Player battling will still be "vanilla". It will lack flavour without species traits, stances, and more reasonable faerie abilities. Stances are a necessity. We have discovered images that seem to represent stances, so I am confident that stances will return when the glitch situation becomes more bearable. Experienced battlers, casual and serious alike, certainly miss stances like fierce attack and berserk attack right now. Faerie abilities tend to serve more defensive purposes; stances offer offensive output that cannot be matched. The day stances come back will be a joyous day for those trying to grind through challengers faster. On the other hand, species traits seem to be forgotten about by most. Species traits offered an extra layer of strategy to battling. Serious battlers know that an important aspect of pregame planning is dictated by the species of the opponent. Offensive and defensive strategies are both slightly tweaked by the species resistances and abilities the opponent brings to the table. The Neopets Team unfortunately shot themselves in the foot by making an all image-based selection system. A likely reason for the hesitation regarding re-adding species abilities may be due to the need to draw images for the abilities. I am about practical, not pretty. Each species has three unique species abilities. I would happily take three hastily drawn universal images to represent a pet's first, second and third species abilities. While not necessary for daily prize battling, species traits offer a nice bit of flavour to 2-Player battling. Restructuring the species traits for more balance between species may be a worthwhile venture, but many battlers would happily take the old pet traits over no pet traits at all. As for the new faerie abilities, well they are not the prettiest addition 2-Player battling has seen in quite a while. The basic idea behind the faerie abilities is great: three abilities per tier, a battler may only choose one. Unfortunately, this tiered system only works if the abilities in a tier are all reasonably equal to each other. Currently, many tiers have a single ability that reigns supreme over the other two, completely defeating the purpose of the tiered system. The idea behind the new faerie ability system was to encourage players to use more variety, which is clearly not happening. If balanced correctly, this new faerie ability system could add variety to competitive battle through diverse faerie ability choices. We had two abilities that could cover five icon types. We had several abilities that could heal one-third of lost HP. We had several abilities that could block a single icon type. We had two abilities that had a tiny chance of freezing the opponent. Multiple abilities that disable both of the opponent's weapons. An ability that fully heals the user's HP. An ability that can reflect two-thirds of the opponent's attack. Lens Flare and its counterparts are the biggest offenders, but too many of these abilities are far too powerful in comparison to Battledome weaponry. Lens Flare is so powerful that both battlers must use it on the first turn to cancel each other out, unless one of them wishes to face certain death. Blocking all icons would have been bad, but disabling everything, the ability to freeze, the ability to heal, the ability to execute any weapon functions at all is simply insane. The dedicated few that are actually battling 2-Player at the moment are declaring no Lens Flare/Warlocks Rage on their boards. The fact that battlers are voluntarily restricting the usage of select faerie abilities should be a good signal that these new abilities are not good for the Battledome. A revamp is necessary for the sake of strategy. Faerie abilities ought to encourage different tactics, not limit them. Although many players have given up hope, a select few players including myself still believe this new Battledome can be a success. It seems like a daunting task, but it is one that is that can still be accomplished by the Neopets Team. I believe that if the Battledome is brought to a state where competitive play is possible, the players themselves can revive the Battledome community. The reason the Battledome has survived all these years has been largely attributed to the dedicated individuals that offer time and effort towards operating events for themselves and others. The competition and companionship that is created by player-organized events keeps the Battledome community together. Those of us at the Jellyneo Battlepedia are excited about the possibilities that could come from a competitive Battledome. At this point I don't wish for Neopets-organized wars, but events designed by players. Events organized by the players are able to give battlers exactly what they want, but the issue we have today is beyond our hands. We need a functional competitive Battledome before we can begin rebuilding the community on our own. For those who have not yet lost hope, keep fighting the good fight. After all, the only thing we can do now is express our support and hope. This page was last updated on April 15, 2013.